1. Teach kids how to grow food and compost. 2. 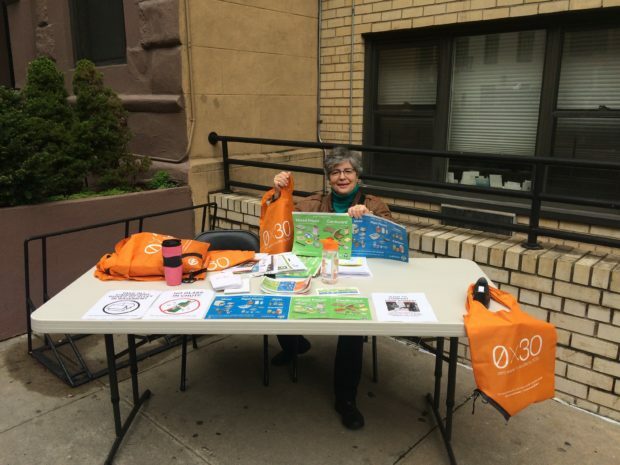 Educate colleagues about NYC Zero Waste efforts, esp. how to prevent waste and sort properly we can help! 3. Engage with your superintendent, landlord, coop board members to up the participation in recycling in your building. Order DSNY’S Recycling Decals and other educational materials. 4. Encourage manufacturers to design products and packaging with more recycled and recyclable components and use less material. Inspo at WeHateToWaste. 5. Press for more NYC Zero Waste drop-off collection sites for organics, support for thrift shops and Stop ‘N’ Swap, and expansion of Materials for the Arts and other reuse efforts for all NYC citizens. Support Right to Repair legislation in New York State. 6. 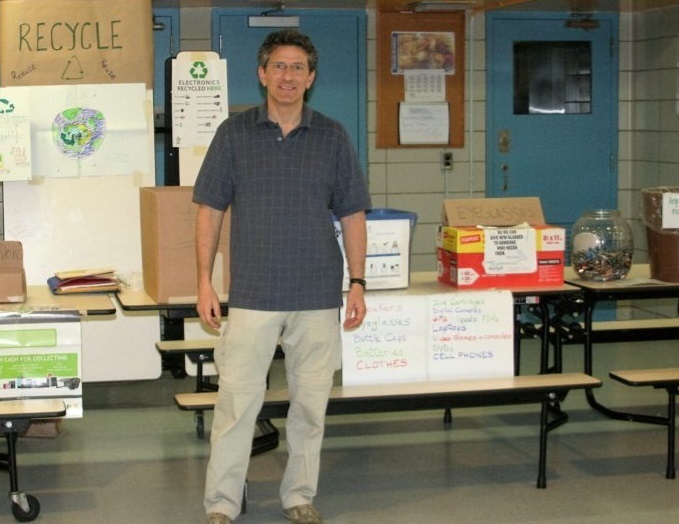 Urge elected officials to invest in public education efforts like GreeNYC, and other NYC Zero Waste recycling, reuse, and waste reduction campaigns. Lobby for an high impact marketing campaign to inspire New Yorkers to change their consumption habits. 7. Lobby NY State elected officials to support a 5 cent fee on shopping bags in supermarkets. We’ve got 53 more ways to nudge New Yorkers and reduce waste in NYC. Convincing officials to invest in public education is one of the most important steps on this list. With public education and sufficient outreach, local residents will obtain the knowledge that they need to understand exactly what they are doing and how they can produce less waste. I’d love to see less presence of plastic bags! I think if common supermarkets place a recycling bin specifically for plastic bags, that would be a start in pushing anti-plastic bag movement even without the elected officials’ say. I know that every household has a basket full of rolled up plastic bag just collecting dust and visually creating opportunities would be another way to regenerate the movement. I hope the Governor gets to decides different next time. I think the first section about children is extremely important. Children are often times the ones that will come home from school and educate the parents about recycling or other environmental issues. Parents are busy with their jobs and other household problems and the children can be an important source of new science and new ideas. Children can be a fantastic liaison to the older generations. And parents will listen to their children more than someone who is lecturing to them on TV. Great tips! I would have often tried to convince co-workers and friends to stop taking plastics bags from the supermarket but I find they don’t really care. It would be great to have an article that I could send them that highlights the issues of plastic bags in landfills and how they impact our environment to impress upon them the importance of bringing a reusable bag. Some people say that they take them and recycle them at the supermarket and it would be great to see the life of a plastic bag after it goes into one of those recycling bins, what happens? 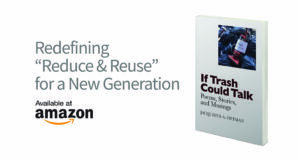 Too often we are disconnect from the recycling process and how much energy and impact it actually has on resources and the environment. Also, I would love to see some of these articles presented in a more graphic/ visual way. I think that reducing waste levels starts with educating the public about the benefits of reusing and recycling materials; the more people that are educated on waste reduction, the more environmentally conscious the public will be. This will in turn, put pressure on local officials, building superintendents, and others to put systems in place to manage waste levels and encourage an even greater movement to reduce waste. Also, if incentives were created to nudge people to reduce their waste levels, the public would be inclined to cut down their consumption to not only better the environment, but also obtain whatever incentives are being provided. These are great ideas! I think the most important takeaways are education and monetary incentive. I habitually recycle and compost because I was taught as a kid in school, so I believe that instilling these habits in kids from a young age will make a huge difference. On the other hand, informing colleagues and friends is a great form of educating as well. In regards to the monetary incentive, I believe the 5 cent fee on shopping bags is super important. Here in San Francisco, I have seen a tremendous reduction in plastic and paper shopping bag use since the ten cent charge was introduced. While I completely agree that a fee on plastic bags does have potential to reduce usage, I think that in order to make a serious change it needs to be taken further. Adding a fee forces the consumer to put a monetary value on the convenience of not having to carry reusable bags to the store. Realistically, no one is going to have more than $1 added to their shopping if the fee is as low as 5 cents per bag. I cannot speak for all New Yorkers, but I do not think the fee is drastic enough for consumers to make a serious effort to remember their reusable bags. The next step to consider would be a large-scale switch to paper bags. I understand why people prefer plastic to paper, they are sturdier, the handles don’t break off, etc. But maybe, the inconvenience of paper bags is enough to ensure that shoppers bring their own bags. Excellent list. In particular, I think that engaging with one’s landlord is an important, yet often overlooked way of reducing one’s footprint. Tenants, including myself, should not assume that how things are are how they should be, and need to recognize that they have agency to make small changes in their neighborhood. I also think that educating children about composting is very relevant and powerful. The information we are given as children stay with us for the rest of our lives- if children were taught how to compost like we are taught how to tie our shoes, it would be a much more common household activity. Great message-a little reminder can go a long way! It is important to hold others accountable to act smartly and reduce waste. I like how this blog post gave advice for different types of situations and people, I can use this knowledge when babysitting, living in a dorm, and voting in elections. I agree that we should teach kids how to grow food and compost, they are the future generation and it’s important to instil sound values regarding sustainability and reuse. Stop ‘N’ Swap is an awesome idea-I am looking forward to checking that out as a resource and recommending it to my peers in NYC. This is a great list; I particularly appreciate the emphasis on educating kids about waste reduction. Habits are learned early, and the sooner we teach kids about recycling, reuse, and reduction the better. It’s also easy to make waste-reducing practices fun and engaging for kids. Also: the use of the word “nudge” in the article reminds me of an excellent book about influencing individual incentives and decisions: Nudge by Cass Sunstein and Richard Thaler. This is an interesting list for those who want to push for community involvement to reduce waste. In regards to the plastic bag tax, I think it’ll be more effective if the tax was split to benefit both side; for example, if the tax were to be set at 5cents per bag, then the government would get 3cents and the retailer would get 2cents (the government would receive more in order to show that this tax doesn’t benefit the rich). In this way, both sides have incentive to participate and enforce the plastic bag tax. Furthermore, the profit that the government receives can be used towards sustainability projects throughout NY, saved as backup funds in case of disasters or emergencies, or help provide reusable items to NY residents. If this deal were put on the table instead, I wonder whether or not our current NY officials would support it. I love the repetitive use of the word “nudge” in this post. It is really hard to convince others to make changes in their lives, especially when it comes to waste. People want to continue living the way they always have, so it is necessary to take the first step by “gently pushing” others to make a few small changes that they will be able to handle, which will eventually make it easier for them to make bigger, more significant changes down the road. Two ideas that I love here. 1) Lobby NYC officials to impose a 5-cent bag fee. Because shopping in NYC is so different from where it is at my home (the midwest), people tend to buy less and only buy what they can carry. There should be no excuse not to have a shopping bag! And even though I’ve been a bit involved at Columbia in sustainability, I’ve never heard of this proposal. thank you for the information. 2) Decals. In my mind, not only did I have no idea that NYC had decals to order, I believe that they are a very easy way to raise awareness even for those people that are a little shy or unwilling/unable to engage with their landlords or friends about sustainability. I think it’s a great way to make a statement without making a sound. The emphasis on education is very important here. A lot of people want to recycle, but unfortunately, a lot of people simply do not know the proper guidelines. This past year at my school, the Sustainability Committee worked to get better signage for recycling, so that students would be able to more easily understand what and how to recycle. I also think its super important to lobby against the use of plastic bags- they are a convenience that can be sacrificed with very little effort, and it has come to my attention that most people do not want them. A petition went out at my school to ban plastic bags on campus, and it garnered overwhelming support. Unfortunately, they have not yet been banned but signs have been put up at every register informing students that a bag will only be provided upon request. People seem a lot more likely to not request a bag than they are to have to remember to say no to one. New York is such a thriving city, and its great to see that New Yorkers care about the preservation of the environment around us. And it’s working! With the new proposed ban on plastic straws, we are taking a step into the right direction! I believe that WE as consumers should not have to be the ones responsible to use our tax dollars on trash that huge companies create. Why are we dealing with soda cans and plastic packaging when these huge corporations are the ones putting them into the waste stream? It’s easy to just say “Don’t buy it then!” , but then you also have the problem of people loosing jobs, and most importantly telling people how they should and shouldn’t live their lives which is completely unacceptable. What I believe should be happening is government officials should put more regulations on the products these companies make. Can this be recycled easily? Does the city have the technology to recycle this responsibly? Is this company willing to put the the cost of investing in this technology? Leading by example and simply discussing how to minimize waste is such an imperative part of tackling trash in NYC. When I’m babysitting and the kids are ready to throw something away, I always urge them to ask if the product can go in the recycling bin. Now they’ve learned which products can and cannot be recycled. Also, some businesses provide incentives when customers bring their own bags but these incentives are often not advertised. For example, Whole Foods has a policy in which customers receive 10 cents off their purchase for every reusable bag used at check out. In addition, Trader Joes often enters customers who bring reusable bags in a raffle to win a gift card. Starbucks, similarly to Whole Foods, applies a 10 cent discount for customers who bring their own cups. Perhaps if more people new about these incentives they would be more likely to be conscious of reducing waste. 5 cent bag fees at supermarkets have been implemented in many places and have shown results in reduction of plastic bags used. This policy should be more widely implemented. I think that incorporating lessons like growing your own food and composting into a child’s education is important to show them the importance and wonders of nature and inspire respect for our planet. If they make connections of food, waste, and sustainability early on in their life, they will be more inclined to take action! When I was in high school I started a club with some friends, sort of on a whim, in which we started a garden and built a compost box. At the onset it was more of a way to spend additional time with friends doing something, but the act of building the compost box and planting the food ended up informing a lot of my feelings as I learned more about how we interact with food and waste. It also encouraged us to talk to the school as a whole about those issues and work the administration to make composting a part of the schools approach to waste from the cafeteria. The values and habits you learn as a child or young adult can be some of the most important as a person grows into adulthood. If you are raised doing certain things that consider the environment they won’t seem like a burden as you grow up.